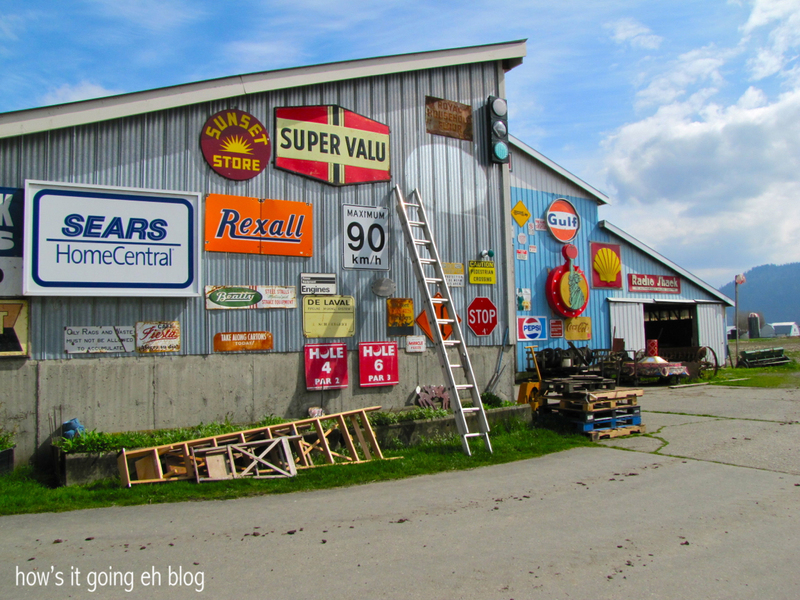 Granny + Grumpa’s Antiques – Abbotsford BC | how's it going, eh? 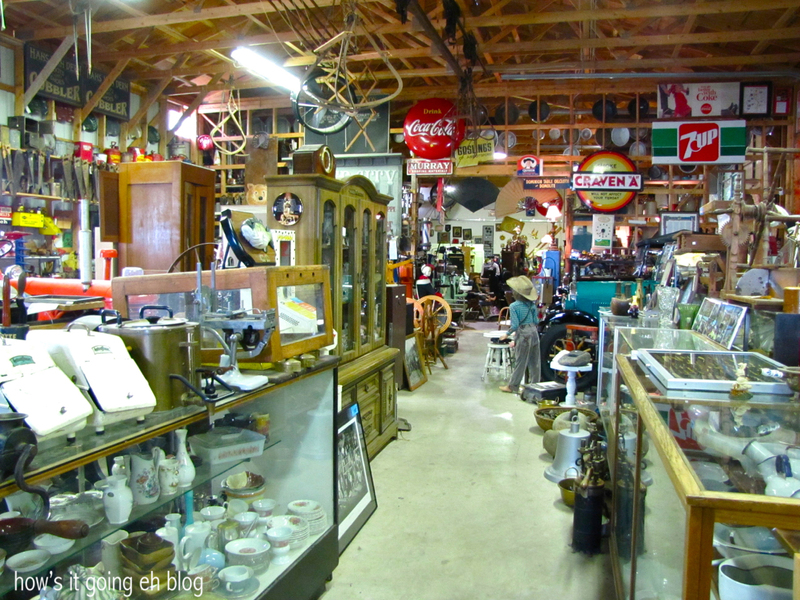 If you like antiques…you’re brain is going to literally explode!!! Don’t say I didn’t warn you! 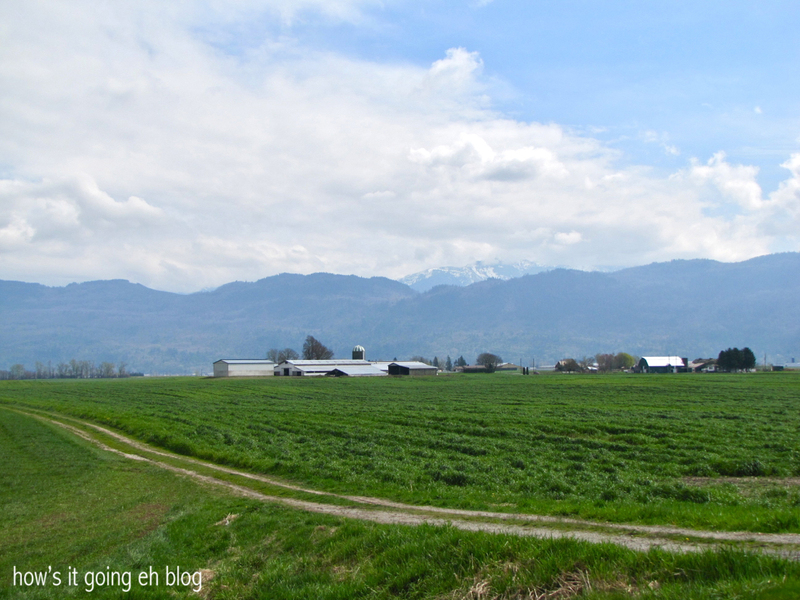 Abbotsford British Columbia is an hour’s drive south east of Vancouver, close to the U.S. border. Their slogan is, “City in the Country”. Jeff was working in Abbotsford, so my main agenda? 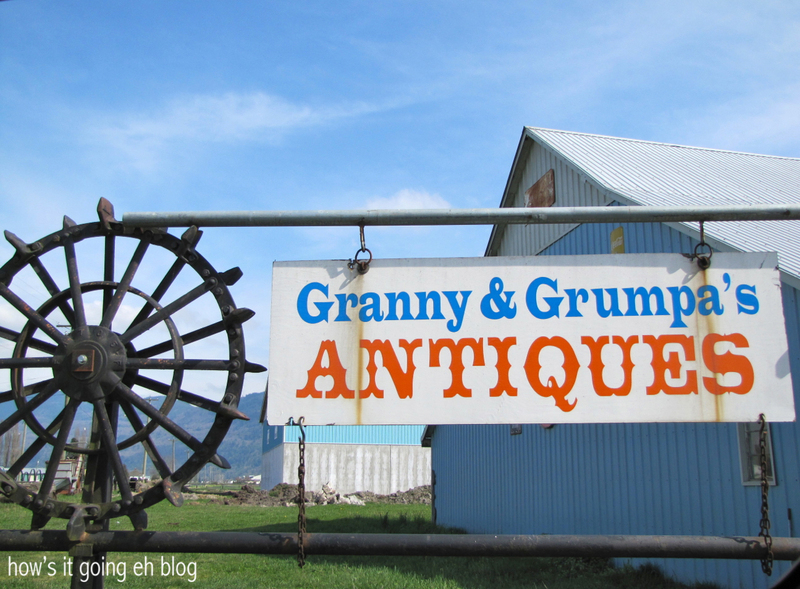 Granny + Grumpa’s Antiques! 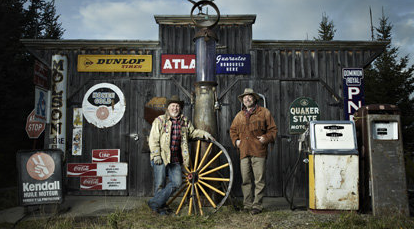 Jeff + I caught an episode of Canadian Pickers that had featured Granny + Grumpa’s. Every time Jeff watches Canadian Pickers he gets really irritable, constantly grumbles + says EVERY SINGLE TIME, “This shouldn’t be called ‘Canadian Pickers’!!! It should be called ‘Canadian Shoppers!!!!'”. 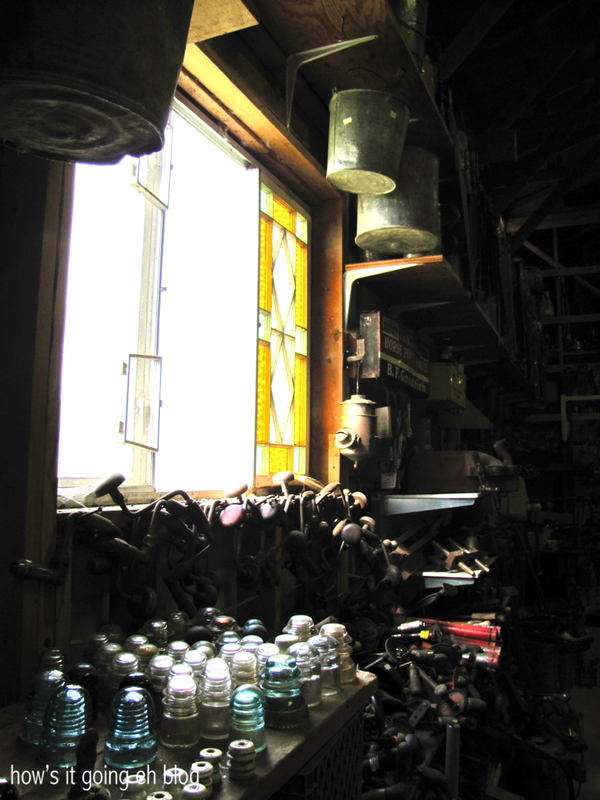 This is because to him, unlike the American Pickers, the Canucks don’t rummage + get down + dirty + scrounge around in dark, dusty corners of god knows where. 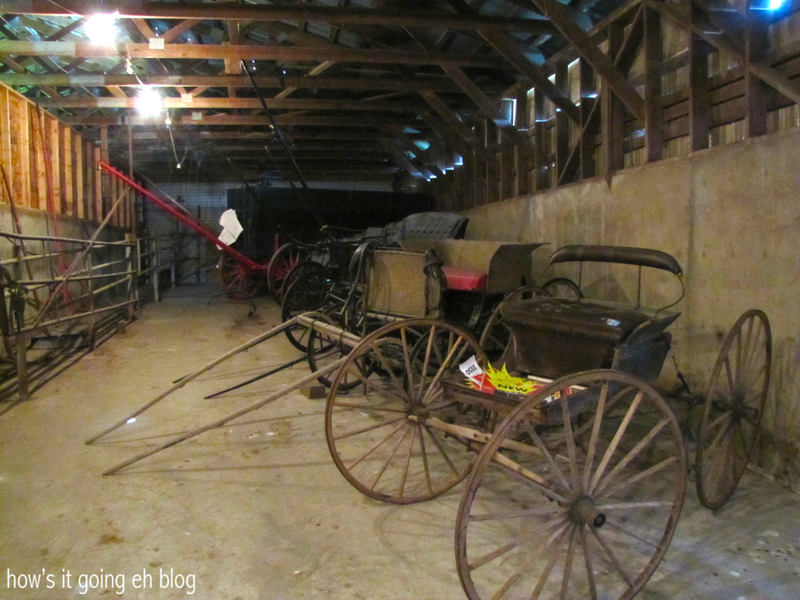 The Canadian pickers conveniently walk into their situations like la-dee-da. 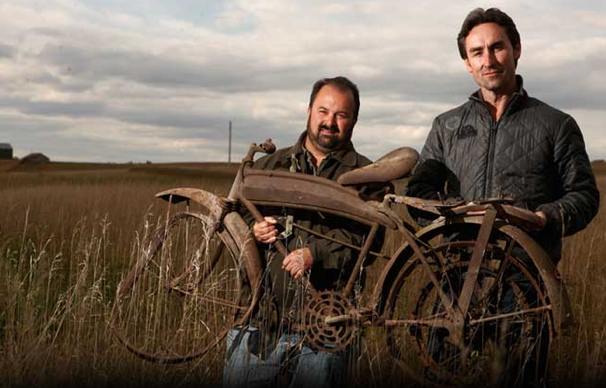 Jeff loooooooooves his American Pickers – because he’s into THE HUNT! But ANYWAYS…I still like watching Canadian Pickers because they go to random places that I never would have thought to venture. Hence, Granny + Grumpa’s! I had to see it for mine own eyes! This place is waaaaay out in the country! There was NO ONE around! This cast a somewhat creepy vibe to the earlier part of my visit. Granny + Grumpa’s is room upon room upon room filled to the brim!!! 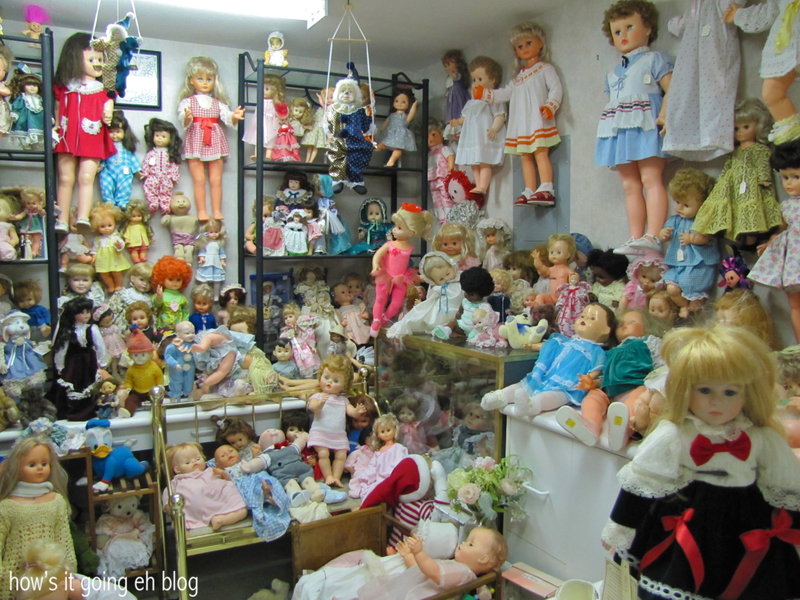 Yes, a room of dolls. 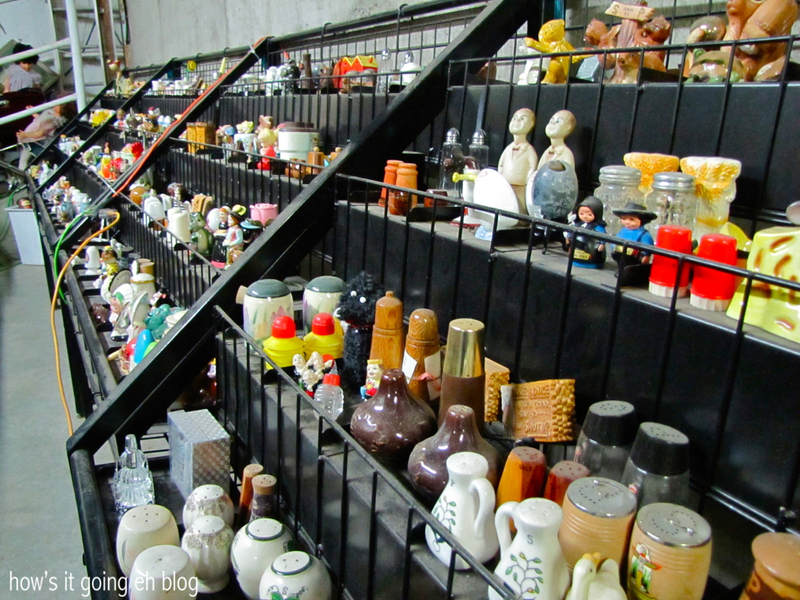 Salt + Pepper shakers, anyone? Anytime I walked through a new door I would squeak out an uncertain, “Hello???”. Not a soul around…. 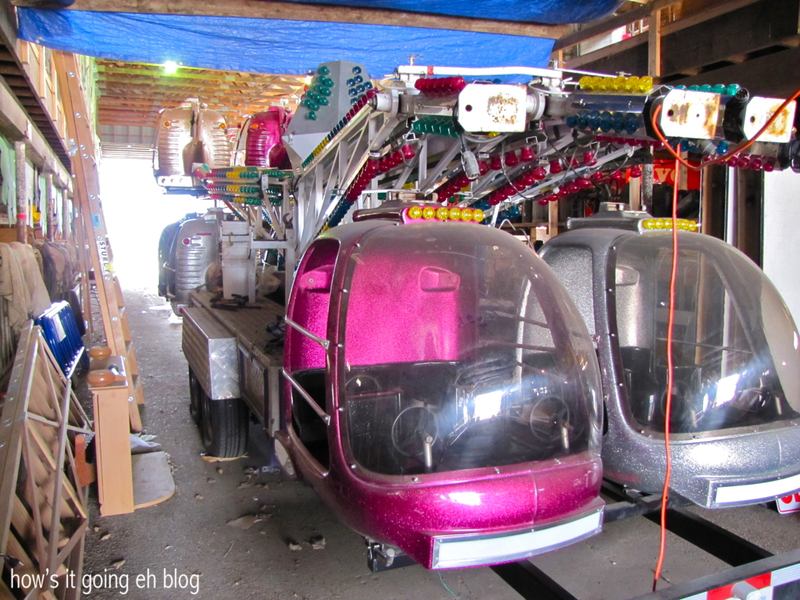 Carnival ride. You know, just in case you were in the market for one. 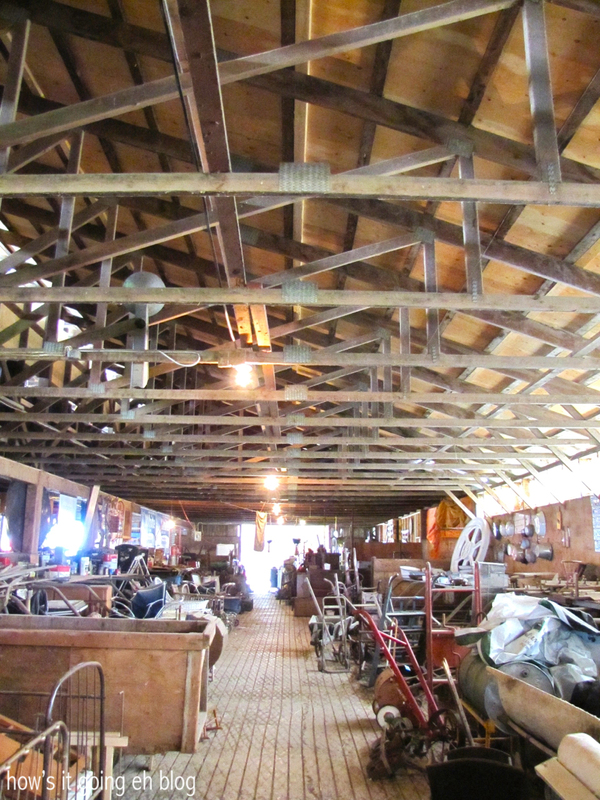 I went upstairs in the barn + I just kept freaking out that I was going to fall through the floorboards because there was SO MUCH stuff up there!!! 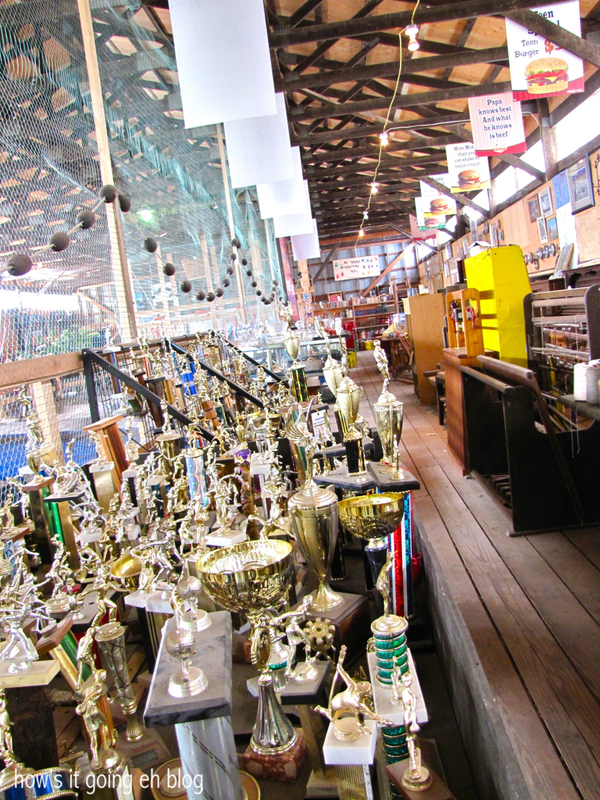 A whole mess load of trophies. 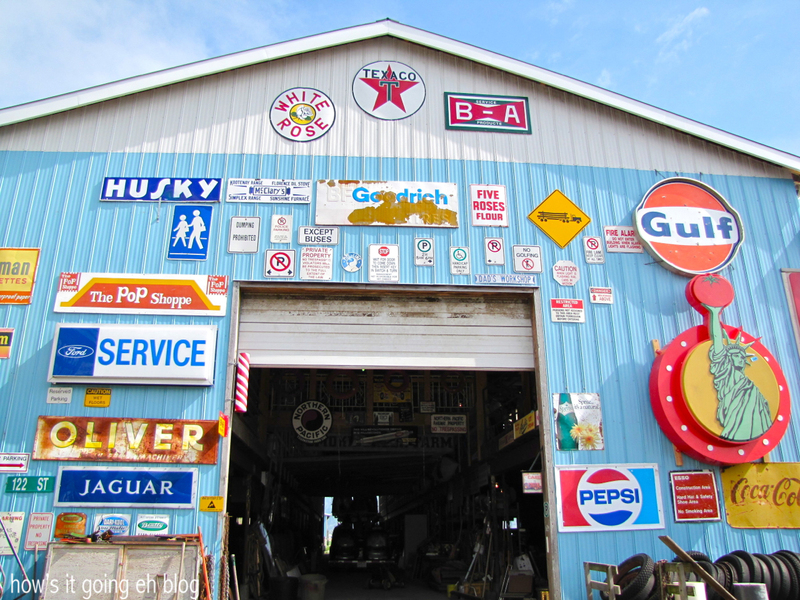 All of the buildings were adorned with old signs. I’m telling you people, it went on + on + on + ON!!! Shudder! I was really getting nervous because my footsteps were the only thing making any sound. But it was so beautiful, still + quiet in the country. 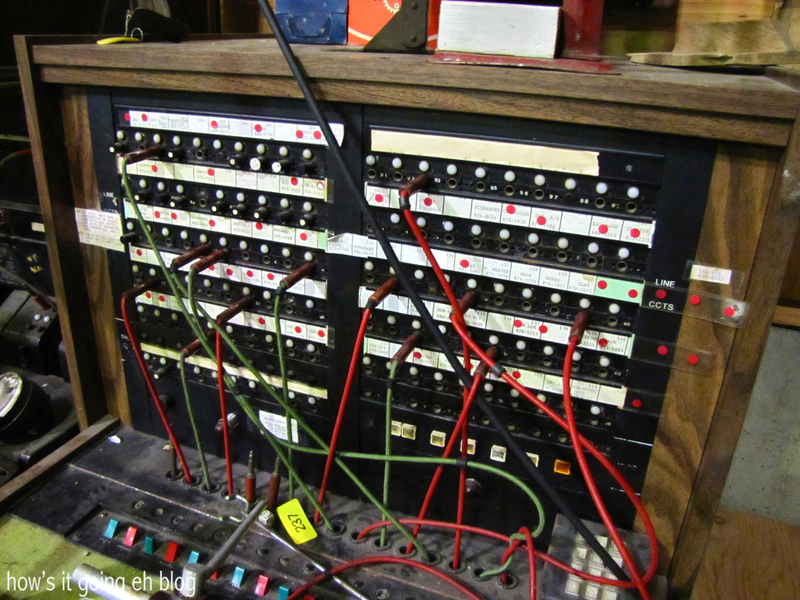 Old switchboard that still had residents’ names + phone numbers! 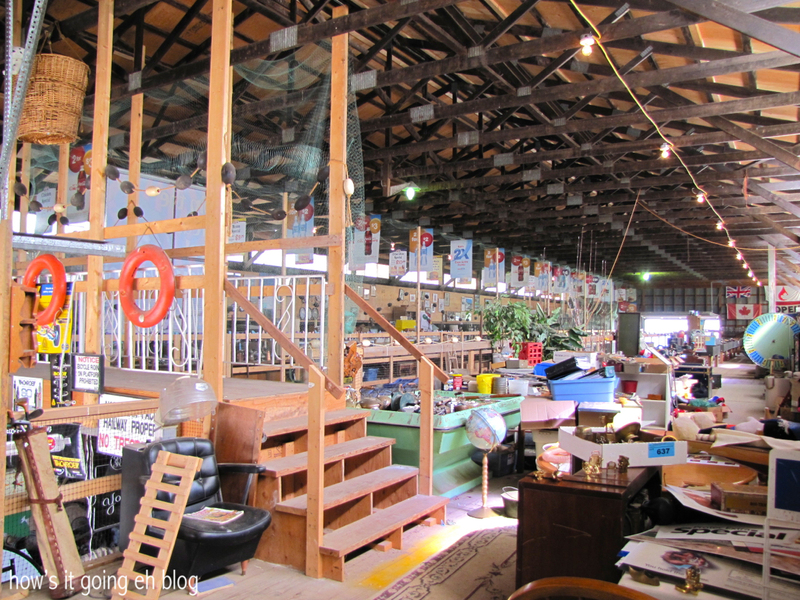 This place is a prop master and/or set designer’s dream!!! 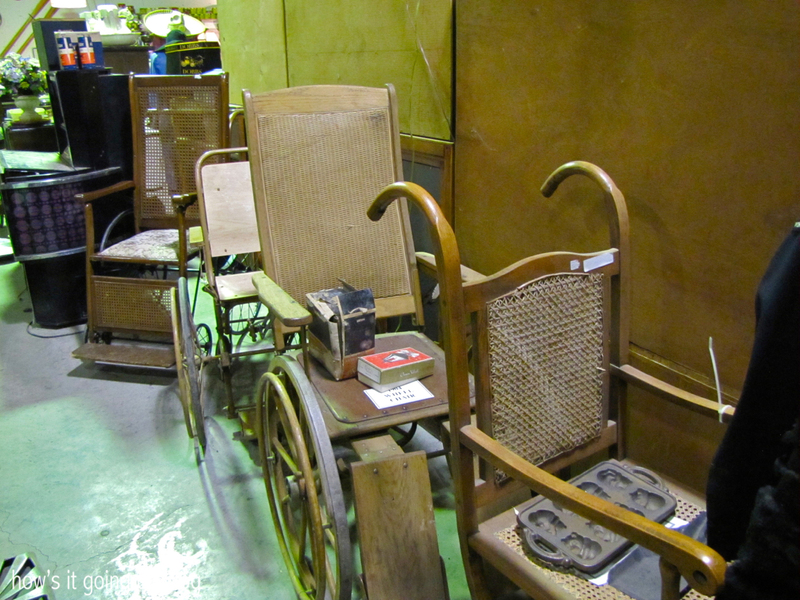 1930s era dentist’s chair, antique bed pans, spinning looms, industrial sewing machines…you name it! 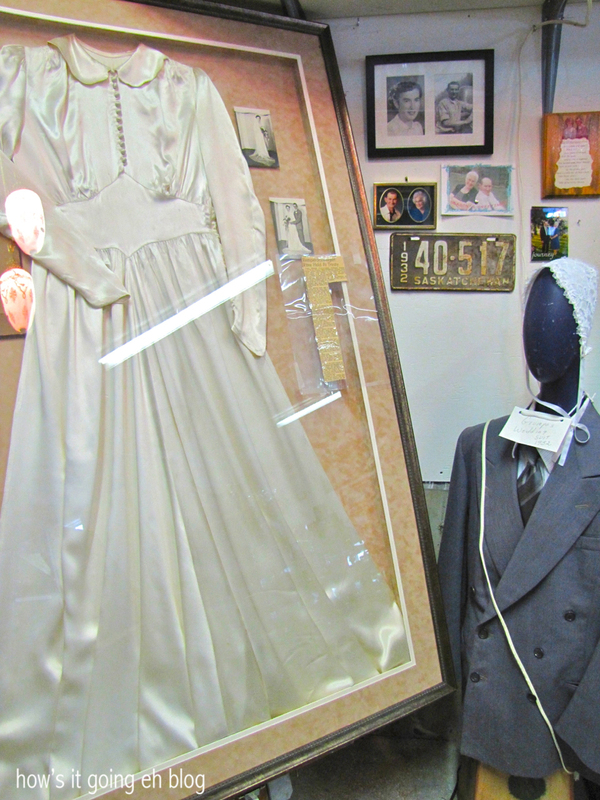 Granny + Grumpa’s wedding attire. It’s pretty overwhelming looking at such a crazy amount of stuff. 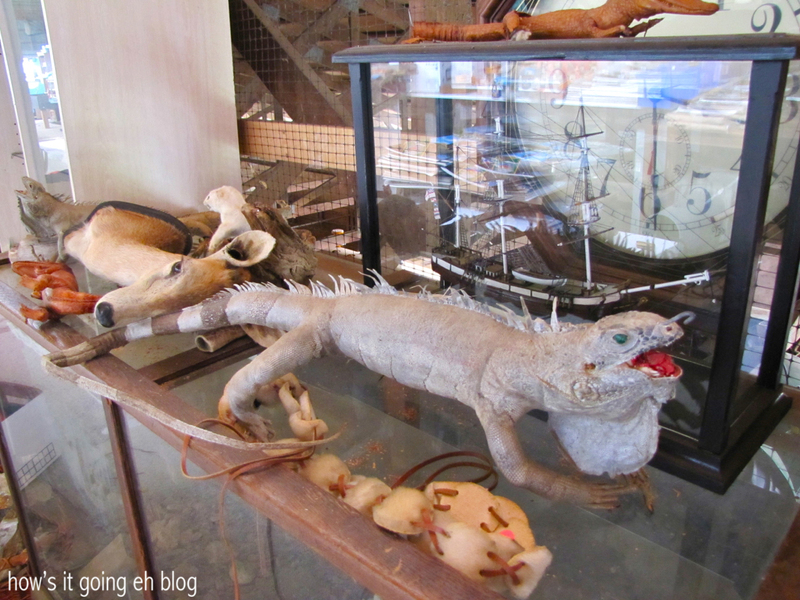 Yet, I spied with my steely eyes these hand crafted wooden things that I just HAD to examine! I dragged a chair over + precariously reached up + managed to bring them down, successfully not crashing into the glass display case beneath me. As I suspected, when rocked from side to side, they made a pleasant, hollow, “Tok tok” sound. I loved them!!! I proceeded to wander around looking for somebody, anybody to purchase them from, while they sang, “Tok, tok, tok, tok.” as I walked. There’s a phone number for Granny + Grumpa’s, but don’t bother calling it, because when I dialed it, a buried phone half a foot away from me rang + scared the living daylights out of me. It was pretty comical. Did anyone come? Nooooooo. 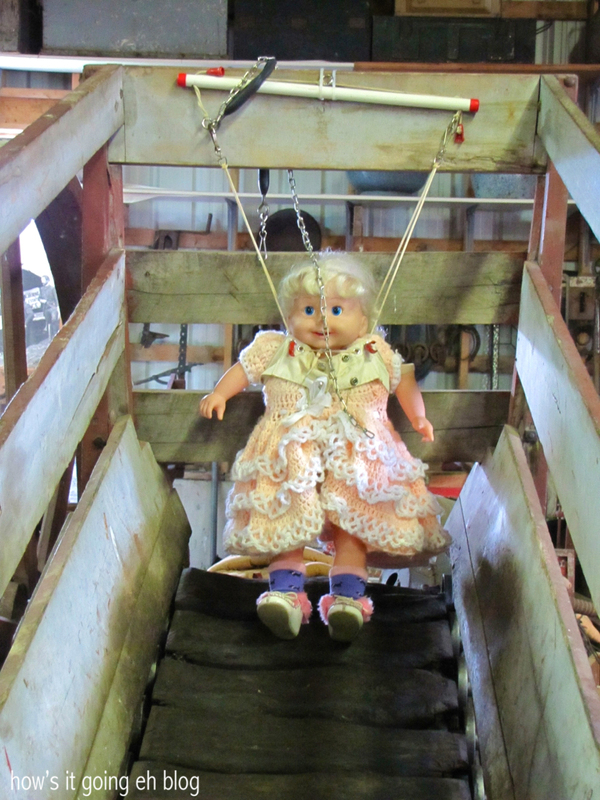 When I was circling around outside, all of a sudden I heard a super loud cackling laughter coming from the barn. I cautiously stepped in + found……Granny!!!!! SHE’S THE CUTEST!!!! She was amusing herself because out of all the hundreds of coffee cans filled with stuff, she knew EXACTLY where to find the metal wire clamps that she was looking for!!! Now that’s seriously exceptional! 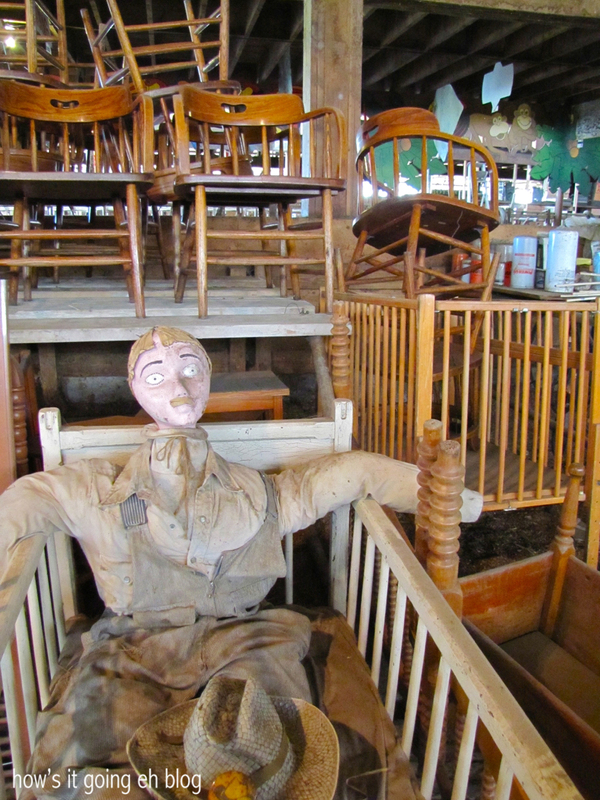 Turns out the wooden items I found were her great-great grandfather’s! 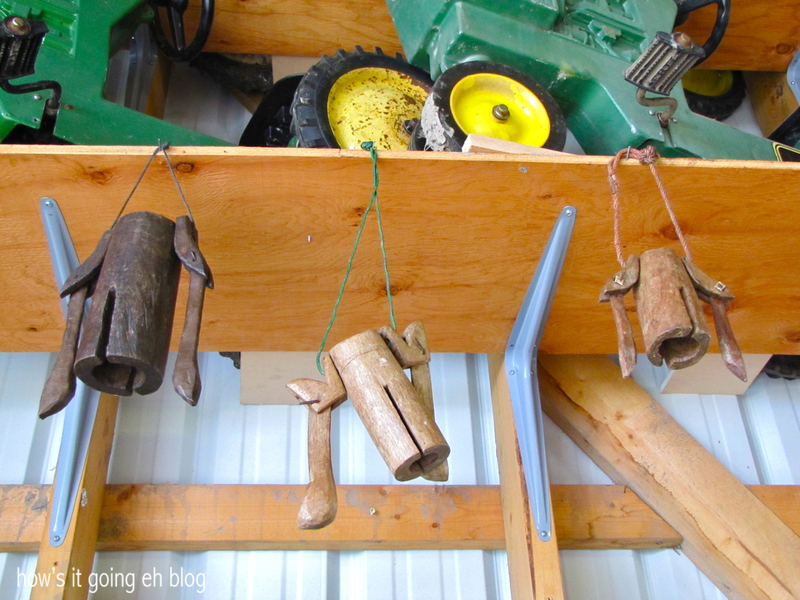 She said that they were bells that he used to put around his cows’ necks. 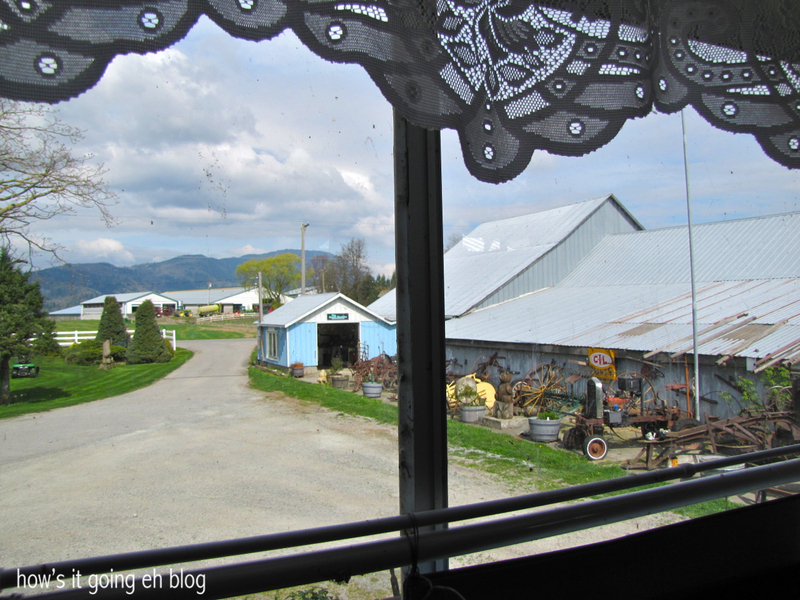 “I can close my eyes + still hear the cows coming over the grassy hill.” Granny reminisced. We marveled over the fact that in the entire place, I happened to pick these special bells out! Well, we got out the step ladder + put them back where they belonged. Granny was still nervous I was going to fall over + eat glass. We chatted + Granny pointed out the first tractor they bought in 1947 to clear the land + the first bike that Grumpa bought with the money he saved from picking strawberries. We laughed about all the odd things that Grumpa brings home (like a huge display case filled with restaurant menus) + I told her I wasn’t going to bring Jeff to visit because he’s going to get ideas!!! We were talking about so many random things + at one point, Granny took me into her house to excitedly show me a newspaper article about the “Miracle Baby”, who in 1987 was found in a garbage bag in Calgary. Granny was so overjoyed to inform me that the Miracle Baby was adopted + raised in a loving home + is now happily married woman. I don’t remember where Grumpa was that day, but when we parted Granny said to me, “Yep, I’d better go get The Warden his ice cream!”. “Who’s ‘The Warden’?” I asked. “GRUMPA!!!! !” she exclaimed loudly!!! OMG, she is an adorable firecracker!!!! Multiple trips to Granny + Grumpa’s are in my future. It’s going to take a while for my brain to digest everything I saw + wanted!!!! And chillin’ with Granny is a hoot + a holler! Until next time! It truly was!!!! You had to see it to believe it!!! That’s what I call organized chaos! WOW, I could spend hours in there. You took a picture of a Jolly Jumper. I haven’t seen one since my sister was a baby and that’s almost 40 years ago. 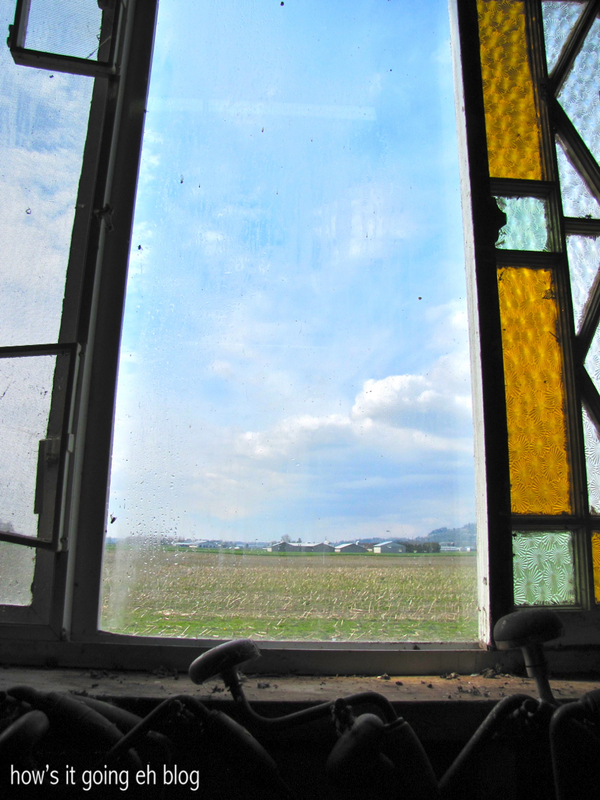 Oh, and the glass cover thingies they used on electrical poles……I always wanted a window sill lined with those so the “sun” could shine through them. Was Jeff drooling the entire time? Is that what that doll was???? Jolly Jumper? She scared me! Jeff wasn’t with me fortunately – he was working hard! 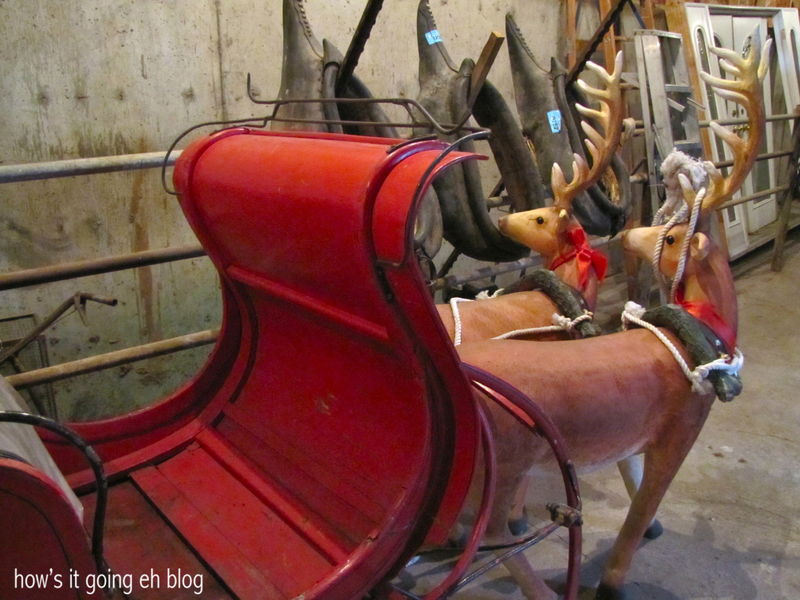 But when I told him about it he said very adamantly, “Oh, you know you’re taking me there…I’M GOING!!!”. Jeff has a bunch of the glass cover thingies….we are Granny + Grumpa lite!!!! 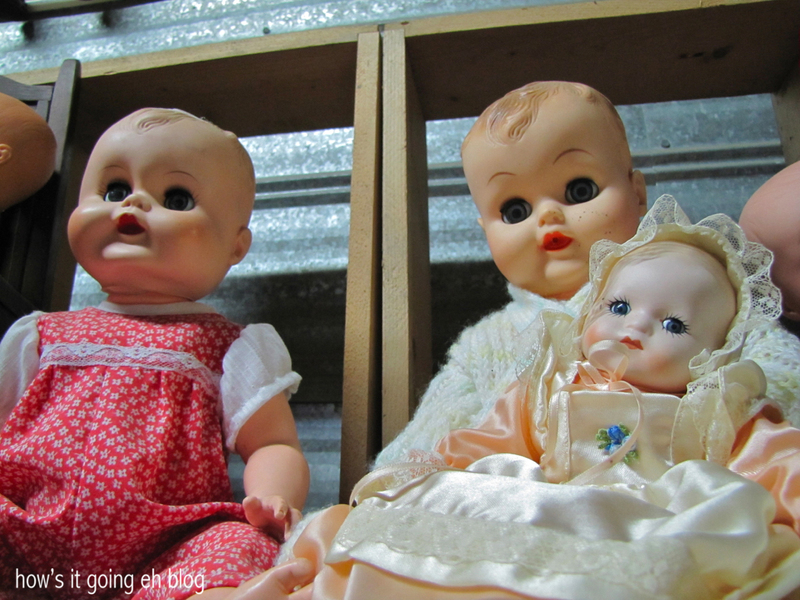 No, not the doll; the thing the doll was in. You hang it in the middle of a door frame and let the kid jumps for hours. I’m sure they’re much cooler looking now, less psych ward like. 😉 I bet Jeff was jealous!! Oh!!! Haha!!! Jeff was crazy jealous! Was there a few years ago. Yes, it was exactly as described. Grumpa was there as well as Granny to add to the interest. Wow!!! I can’t wait to meet Grumpa! 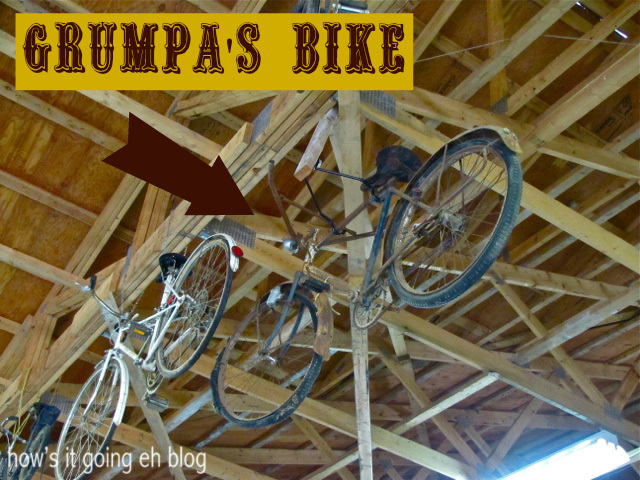 How did you find out about Granny + Grumpa’s? 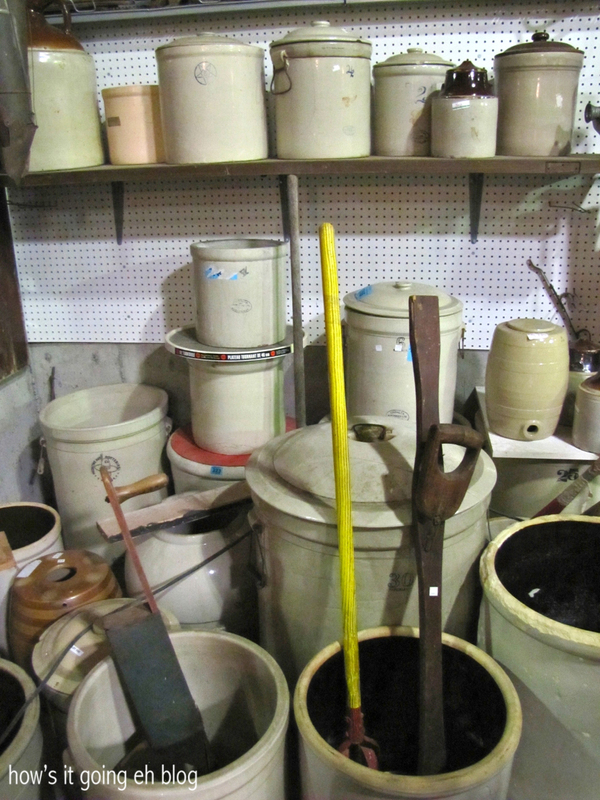 and Granny’s,…wut a amazing assortment of mish-mash !!!!!!! I was there FOR HOURS!!!!!!!!!! No, Jeff was busy working a 16 hour day! Someone’s gotta pay the bills for this Yankee!!! Have fun today + eat some sushi for me at Sushi Gen!!! Haha thanks Deb!!! I love me an adventure!!! VERY trusting! I know, I hope people aren’t taking advantage of lil’ Granny!!! Omg Michelle, if you went there it would totally explode. 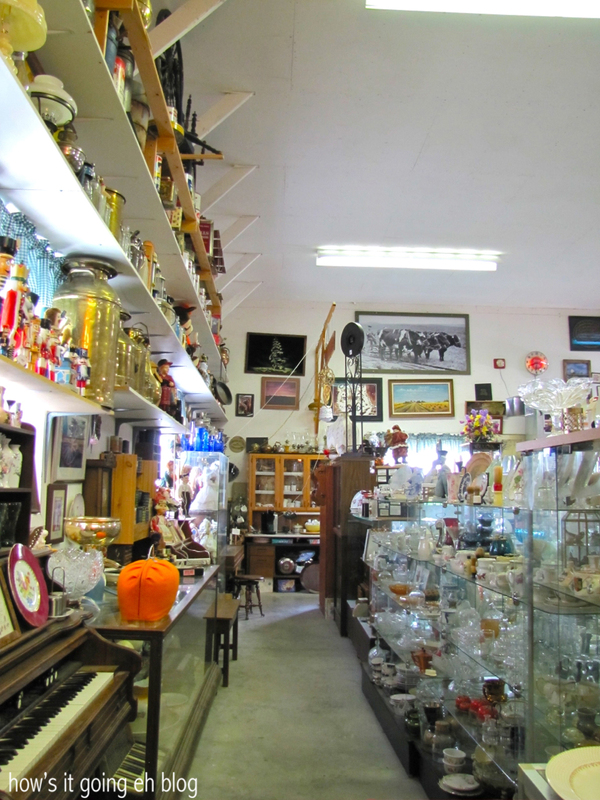 Remember that great 2 story antique shop in Nanton? Multiply that by 70!!! I’d have to pack a lunch and spend the day there! You would! I left there starving + light headed! No joke! It was DEFINITELY Sarah + John heaven for realsies!!!!! Miss you!!! Yay you found it!! I have not been out there yet, but one of these days I need to go check it out!!! Yahoo!!! It’s almost like a museum of sorts!!! I was loving the Fraser Valley!!!! Suuuuuuper cute. I can’t wait to meet him! I love antique stores and thrift shopping! I love going through old books! 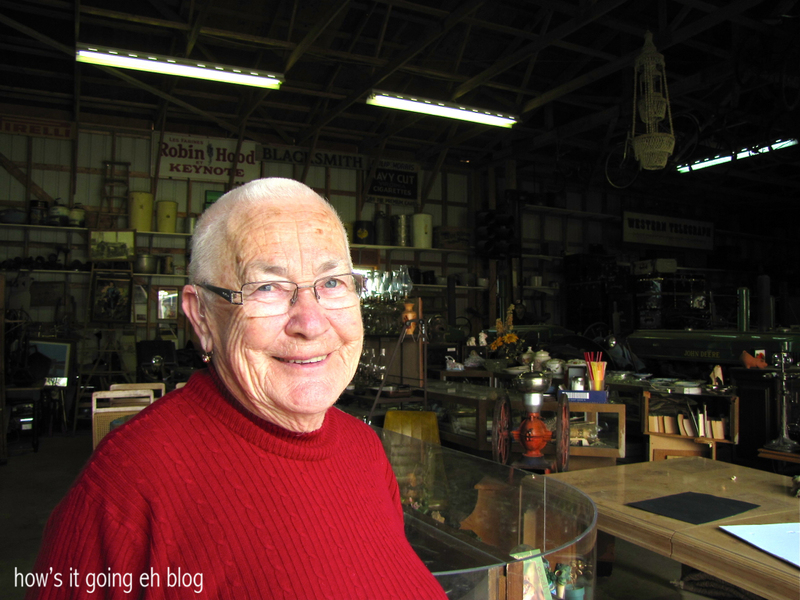 I guess the junk store business what a pat rat like me will do when I get older. I hate throwing things out. I’m putting some stuff into storage until we can move it all across the border. We have 6 pages of b4 forms filled out!!! And half of my stuff is getting donated to our favorite church charity…at least it is not getting thrown out, someone else will be blessed with my mess! We have a 10 foot shipping container full of stuff in Vancouver + a 40 foot shipping container full of stuff in Alberta!!!! Talk about stuff!!! It’s actually pretty insane. 40 ft shipping container’s heeheehee….LOL!!!!!???!!!!! Nope! He’s never been there thank god! Very Expensive.. over too much for the value. 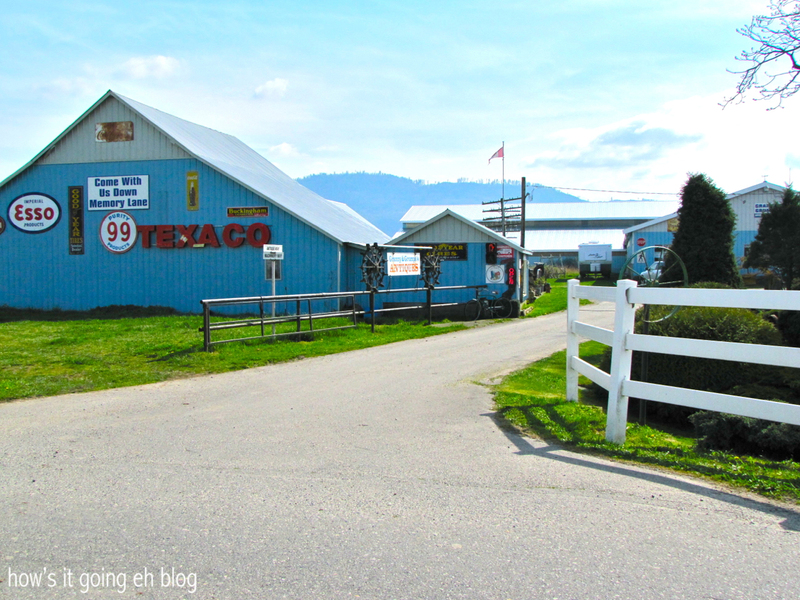 Abbotsford Tulip Festival 2016 | how's it going, eh?